Putting aside melee attack, missile attack, or the cavalry charge bonus, which cavalry units have the greatest amount of defense and in particular armor? Usually the units with the most armor have the greatest amount of defense, but other factors like defense skill and the quality/size of their shield are taken into account. As the Romans, you get great heavy infantry in all three eras, Camillan, Polybian, and especially the Marian period (with generally larger Latin-Roman legionary units than previous ones). However, the heaviest cavalry units of other factions are not available, only the mid-tier ones. From what I've seen the heaviest cavalry available to the Romans are the Scythian nobles, with 7 armor points, just one point above the maxed out, fully armored and reformed Celtic Donnoi Eporedoi and elite Boii cavalry (also available as recruits for the Romans). Obviously the Hellenistic factions have the Kataphractoi unit. Even Koinon Hellenon can recruit it in the Near East, despite being shut off from most other elite units belonging to other Hellenistic factions. Obviously the heaviest units available to the Scythians, Saka, Armenians/Hayasdan, and Parthians are their own unique cataphracts and bodyguards. I'm assuming the armored Indian elephant is the most armored mounted unit for the Taksashila faction, but I don't think any of their regular cavalry is that heavy from what I've seen. The Carthaginians obviously have their own elite cavalry, but the Sabaeans and Nabataeans are just nothing but light and mid-range cavalry, right? The Getai have a decent field of heavy cavalry options with the heavy-hitting Tarabostes and the javelin-wielding Thracian noble cavalry (the latter of which have 5 armor points, the same as Equites Auxilium for the Romans). Would someone like to compile a list of what they know? I guess this can all be gleaned from the export_descr_unit file, but it's rather tedious to go through it all. If you count AoR units, you'll get into a huge mess, especially due to armour upgrades, since it appears that not every faction can upgrade all units fully (at least I wasn't able to get second armour upgrade for my Ambaktoi Kingtoi as Pontos so far), and armour upgrades add in practice more than 1 armour points each. Due to this, I think toughest AoR cavalry unit would be Galatian cavalry, with 5 armour, 3 shield and two upgrades available, which makes them actually tougher than Skythian nobles...in fact, they might be, thanks to their high secondary attack, best melee AoR cavalry in game. Armoured cavalry is, however, much rarer as you go west, and I believe Eporedoi Donnoi are best armoured cavalry available to anyone west of Balkans. Last edited by Sar1n; April 07, 2019 at 09:08 PM. Pretty much. I love the Galatian cavalry, colonist swordsmen and retainer spearmen infantry, some of the best units in the game. I think you're right about the Eporedoi Donnoi cavalry of the continental Celtic factions. The second heaviest, with one or two armor points less, would be the Triveri cavalry of Germania and Volcae cavalry of southwestern Gaul. I don't think any of the Iberian cavalry units are particularly heavy, even if they are effective. The elite ones available for recruitment by other factions, the Celtiberian Riders and the Lusitanian Ippones, have like 3 or 4 armor I think, while others like the Cantabri only have one armor point! I think the (relatively new) Ilergetes/Ilergetan cavalry of northeastern Iberia have three armor points if I remember correctly. That being said, the Italic/Illyrian Histro-Venetic cavalry and the Delmato-Pannonian cavalry actually both have five armor points, just one armor point less than Eporedoi Donnoi! That also puts them on the same tier as the Equites Auxilium and Equites Polybian cavalry. As for the Greeks, I think the Thessalikoi cavalry are one armor point above Lydian lancers, but both are slightly more armored than the javelin skirmishing Lonchophoroi Hippeis or even the Aspidiotai Hippeis lancers. It's great that Rome can recruit all of these too! Unfortunately, though, Rome can never recruit the elite Hetairoi. That's a shame. Last edited by Roma_Victrix; April 07, 2019 at 10:51 PM. It won't allow me to read what you've linked to there at GB. Would you care to summarize what it says, please? You've made me curious about it now. Also, say what you want about Iberian cavalry being generally lighter than the Gallic and Boii elites or the Italic, Illyrian, Carthaginian, Numidian and Greek cavalry elite. The Iberian cavalry choices are at least more heavily armored than the Pritanoi in the British Isles. Each unit there aside from the Markakoi cavalry and Arioi infantry has like 1 armor point. LOL. They make up for it somewhat by having some defense skill and shields, but not by much. Last edited by Roma_Victrix; April 08, 2019 at 06:20 AM. Re the Celtic/Galatian noble cav, don’t the armor upgrades actually provide 2.5 bonus each, even though it only shows up as +1? So, fully reformed, Celtic cav end up with like 9 armor and Galatians with 10. Also I love their unit models. Last edited by Krampus; April 08, 2019 at 09:15 AM. It's somewhat less than 2.5 per upgrade, but more than 1. Had it been 2.5, they'd be toughest cavalry in game, but try to test a custom battle against Saka cataphracts, even on medium, if you manuever around to avoid charge, Galatians will lose in melee. Both units have same secondary attack, Sakans have 10 armour+9 skill, Galatians have 5 armour, 7 skill, 3 shield+two upgrades, so they should have a little advantage had the armour upgrade been truly 2.5. Edit: also, best looking capathracts are Armenian ones. Last edited by Sar1n; April 08, 2019 at 12:11 PM. I still don't get how an armor upgrade registers as +1 to armor, but is actually more. It shouldn't work like that. @Sar1n, there’s lots of folks who say that the bonus is around 2/2.5. Admittedly I don’t know where these #s came from or how people discovered it. And I haven’t playtested unit vs unit in a custom, and I’m in no place to deny the results you had, but are you sure that there weren’t other reasons why the Saka Cataphracts won? Perhaps the terrain bonus/penalty, heat stat, unit discipline/spacing? I’m away from the edu so I don’t know them off the top of my head. Ah sorry. It is pointing out the lack of indication for a germanic origin of the Treviri. In fact, the account of Tacitus on the subject is very late and the post-caesarean period is known to have been the moment where germans migrated close to the border. You might want to check your glasses prescription there, bro, because I clearly mentioned the Numidian elite cavalry in the very post right before yours here. See the time stamp. Cool! Thanks for sharing, although I wasn't claiming that they were Germanic. I merely said they came from Germania, which is still true even if that area was inhabited at the time by Celtic peoples instead. Last edited by Roma_Victrix; April 08, 2019 at 04:01 PM. I merely said they came from Germania, which is still true even if that area was inhabited at the time by Celtic peoples instead. Weren't the boundaries of "Germania" kind of hazy anyway, not just defined by the Rhine? I was under the impression that lands immediately west of the Rhine were also traditionally considered part of Germania, both before and after they were conquered and settled by the Romans in the 1st century BC. I don't think the Romans were being entirely cheeky when later in the 1st century AD they named those provinces Germania Superior and Germania Inferior in what is now Western Germany. I think they had always viewed those territories as vaguely being part of Germania, at the very least the borderlands between Germania and Gaul. Welcome to the joy of modding M2TW, where half the game is knowing what doesn't work the way it is supposed to. The Swiss plateau was a part of Germania superior from the Lake Geneva to the Lake Constance... I think there is really no geographical wisdom in this division. Probably they put in it everything that could be subject to germanic incursions during the Imperial period. While the main city of the Trevires was in the province Belgica (Augusta Treverorum, today known as Trier) and their southern territory in the province Germania Superior (I think they remove it on purpose to weaken them). Clearly, Romans didn't care about geography as they didn't care about ethnology either. 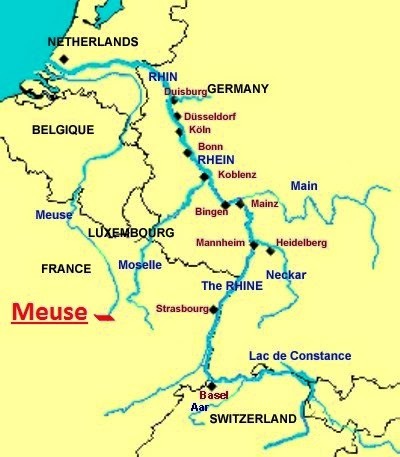 Caesar implicitly said that the Rhine was the limit for Germania, this is the only basis I think that is consistent.